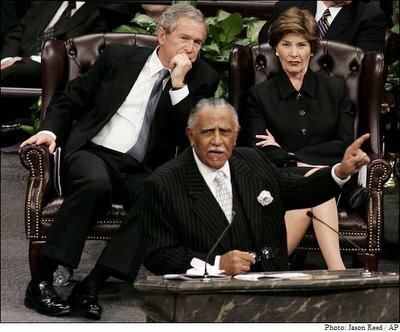 At Coretta Scott Kingâ€™s funeral today, some of the speakers used their eulogies as an opportunity to take cheap shots at President Bush. Indeed, it was no-class politics of the worst kind. The most notable disparagements came from former President Jimmy Carter and Reverend Joseph Lowery. â€œWe know now there were no weapons of mass destruction over there/But Coretta knew and we knew that there are weapons of misdirection right down here/Millions without health insurance. Poverty abounds. For war billions more but no more for the poorâ€ (source). â€œThe efforts of Martin and Coretta have changed America, they were not appreciated even at the highest level of government. It was difficult for them personally — with the civil liberties of both husband and wife violated as they became the target of secret government wiretapping, other surveillance . . . and as you know, harassment from the FBIâ€ (source). â€œThis commemorative ceremony this morning and this afternoon is not only to acknowledge the great contributions of Coretta and Martin, but to remind us that the struggle for equal rights is not over. We only have to recall the color of the faces of those in Louisiana, Alabama and Mississippi. Those who were most devastated by Katrina to know that they are not yet equal opportunities for all Americansâ€ (source). Carter and Lowery threw red meat to the crowd, and the crowd pounced on it. Both of their statements were met with raucous and extended ovations from funeral attendees. The saddest part about these cheap partisan swipes is that they distract from the legacy of Coretta Scott King as a civil rights leaderâ€”a legacy that should be celebrated by every American, regardless of oneâ€™s party affiliation or views on the Iraq war. The non-violent protests led by Rev. Martin Luther King and his wife quickened the heart of a dead nation that had imbibed the poison of racism and discrimination. As a result of the movement they led, the conscience of America was revived to reject the unjust laws that were the basis of segregation an to pass the Civil Rights Act of 1964. This great legacy of Rev. and Mrs. King belongs to all of us. Yet Carter, Lowery, and others made it sound as if it belongs solely to liberal Democrats and all those who oppose George W. Bush. I donâ€™t buy it, and Iâ€™ll wager most of America doesnâ€™t either. Now this next comment is not targeted toward any single party but to the whole lot of our political system. The New Testament teaches that as Christian brothers we are to show humbleness and submission to one another. Somewhere between 90% and 100% of our politicians claim to be Christian. So can we picture what Washington would look like if our politicians acted like Christians. This task is impossible for you or I, but the God I serve has altered history on more than one occasion. We must pray! well said Denny. I thought better of Carter. great words…i’m new to your site. i watched “highlights” from coretta’s funeral and completely agree with you. also, the post about bono…evangelicals seem to be “turning a deaf ear” to much of the very blatant, pluralistic statements being made by those in “popular” christianity. Great site. I linked here from euangelion. I know that this topic is a little old now, but I thought I would weigh in. Although I understand where you’re coming from, I disagree quite a bit with your post, also with those who have commented so far. Firstly, this was a political event, and it is naive to think otherwise. Save Ford, all living presidents attended, but not because they closely knew Mrs. King (except Carter). Secondly, the issues raised were issues that are meaningful in light of the King legacy; poverty, equal protection, civil liberties, and opposition to an unjustified, poorly concieved and executed war, that disproportionately affects the African-American population. thirdly, Carter’s first comment, re: wiretapping, was mild to say the least. His more pointed comment, which was re: Katrina, was an acknowledgement of Pres. Bush’s failure to recognize it in the State of the Union, just a short time earlier. I strongly suspect that his comment would not have been made or, if made, would not have recieved such a response had Bush honestly addressed the issue in the State of the Union. Fourthly, Lowery is not just some preacher who is not aware of his surroundings. Being the co-founder of the SCLC (w/Dr. King), and a nearly life-long associate of Mrs. King, he has every right to address issues that Mrs. King would clearly have been concerned with. To just comment on how brave she was, or how well she handled Dr. King’s death, would have been disingenious in light of her concerns. He is a prophetic (and politically savvy) preacher who has spent his life speaking truth to the powerful. I think the picture you posted shows just how uncomfortable this must have been for Bush. It was a no-win situation for him. He had no choice but to go, but he must have known that he was going to be in for a long day. Sometimes politics doesn’t give even the president a way out. Lastly, this is not a regarding comments in your post, but did you hear Bernice King? She can preach! She made Bill Clinton sound like he should be attending Toastmasters. Great site. I look forward to checking in regularly. I ditto tracey’s comments re: your bono post.